Nineties supermodel Kirsty Hume takes newcomer Anna Ewers under her wing in an editorial for Self Service's Spring/Summer 2014 issue. The Scottish flaxen haired beauty and the teutonic Ewers hang 5 with a motley crew of surfers as they comb the beach in high fashion threads styled by Marie Chaix. Photographer Glen Luchford juxtaposes the surf and turf lifestyle of Los Angeles beach communities with sparse studio shots of the Hume and Ewers as the pair done free-spirited designs from the Spring/Summer 2014 collections of Céline, Christopher Kane, Proenza Schouler, Prada, Kenzo, and Marc Jacobs. 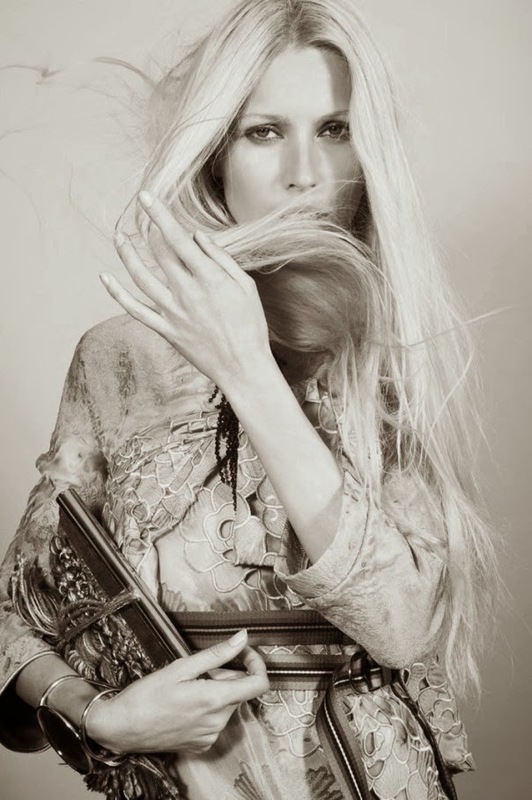 Thirty-seven year old Hume initially rose to fame during the mid-nineties appearing on the covers of American Vogue, Harper's Bazaar, W, and Allure before retreating from the modelling limelight to focus on motherhood and later studies in paganism and art. Hume, an ardent advocate for eco-living, recently modelled for the Spring/Summer 2014 Look Book for AWAVEAWAKE an eco-friendly label which produces a line of naturally dyed clothing. Ewers whose own likeness to nineties super Claudia Schiffer, has since emerged as one of the most in demand newcomers appearing in Spring/Summer 2014 campaigns for Prada, Alexander Wang. Versace, and Marc Jacobs Fragrance. Both Ewers and Hume are reunited for Self Service, having modelled together previously in Proenza Schouler's Spring/Summer 2014 show.